Description: KetoVie Café Creamy Cereal is a hot cereal mix is a great breakfast addition for individuals following the spectrum of ketogenic diets. A 2.3:1 ketogenic ratio with only 2.5 g net carbs (total carbs minus total fiber). KetoVie Café Creamy Cereal may be incorporated into the daily meals and snacks of individuals following the spectrum of ketogenic diets. KetoVie is designed for individuals over one year of age and indicated for the dietary management of intractable epilepsy and other conditions managed by a ketogenic diet. 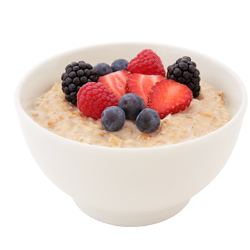 Preparation: To make one 5 oz (142 g) serving of hot cereal: Stove Top: Mix 3 Tbs cereal with 1/2 cup water, cream or preferred liquid in small pan, bring to boil, turn heat down, cover and simmer for 3-5 minutes. Microwave: Mix 3 Tbs cereal with 1/2 cup water in microwave safe bowl. Microwave on high for 2 minutes, stirring once at the halfway point and when finished. Let stand a few minutes before serving. Serve hot KetoVie Café Creamy Cereal with butter, cream and/or desired keto-friendly sweetener. Storage: Once open, reseal bag and store in refrigerator or freezer to preserve freshness for up to 6 months. Ingredients: Coconut flour, hazelnut flour, lecithin, coconut oil (gum arabic), creamer (sunflower oil [tocopherols], maltodextrin, modified food starch, mono & diglycerides), macadamia nut meal, psyllium, cinnamon, glucomannan, salt. Contains nuts. Manufactured in a facility that uses eggs, milk, nuts, soy and wheat.